The EAC (East Australian Current), popularised by turtles in Finding Nemo, does actually exist, so well done Hollywood fact-checkers. The current is also constantly transporting marine creatures south, certainly as far as Sydney and often much further, to the Victorian coast. It is not, however, the turtles that interest Dr Will Figueira of the university of Sydney. Instead he focuses on tropical fish that are involuntarily and irreversibly swept hundreds of kilometers down the coastline to temperate ecosystems. 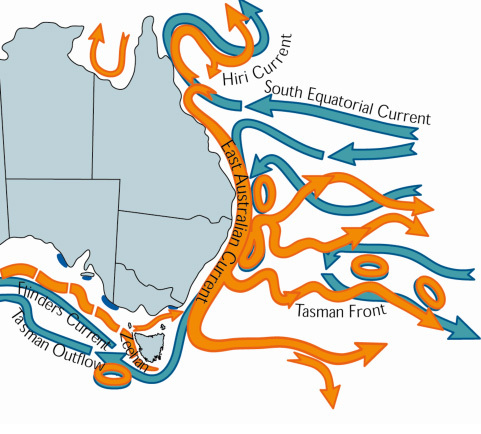 The currents at play off the eastern coast of Australia. Image source. As Dr Figueira stated in a recent seminar, this has drastic repercussions for the individuals in terms of survival in their new surrounds. This phenomena also provides some insight into the ecosystem changes that may occur as the climate and oceans warm. This long-distance dispersal is only possible during the larval stage of development, which all marine fish go through. Fish, and many other marine animals, have a larval stage to aid in dispersal of the new generation away from the breeding grounds. This helps increase the distribution of the species by colonising new habitats and helps lower the chance of inbreeding¹. As larvae the fish form part of the plankton clouds on which large marine organisms, like baleen whales, feed. It is not until the fish reach a mature stage that they will resist the current and attempt to settle in an appropriate habitat. 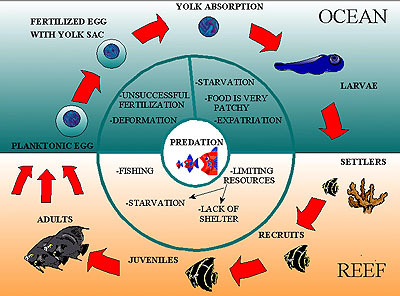 Life cycle of a typical marine fish. Image source. Dispersal, especially when facilitated by strong currents like the EAC, will likely move the fish outside of its optimum habitat. Figueira has spent the last decade investigating the persistence of a number of tropical fish species in the sub-optimal temperate waters on the south east coast of Australia. Obviously, as these fish are not adapted to the cooler waters they usually die. Figueira has found that the critical threshold for survival is around 17-19°C for most tropical fish². So, if the temperature of the water remains above this threshold over winter, the tropical species could establish a colony. So far this has not been observed. Warming temperatures may soon make it more common for tropical colonies to persist for multiple years. By 2080, Figueira estimates that 100% of winters will be survivable for 5 out of the 8 species he has worked on². This will result in a range shift for these species, which may suggest that all marine ecosystems will (attempt to) shift several degrees towards the poles. While studying the tropical vagrants between the Solitary Islands (30°S) and Merimbula (37°S)(South GBR 24°S) Figueira examined the characteristics that may change with temperature. As fish are cold-blooded, their metabolism will slow down at lower temperatures, which causes them to eat less and may result in starvation. Coupled with this is a lower growth rate and a slower burst speed, which is used to escape predators³. All of this means that the tropical fish are disadvantaged compared to their temperate cousins. 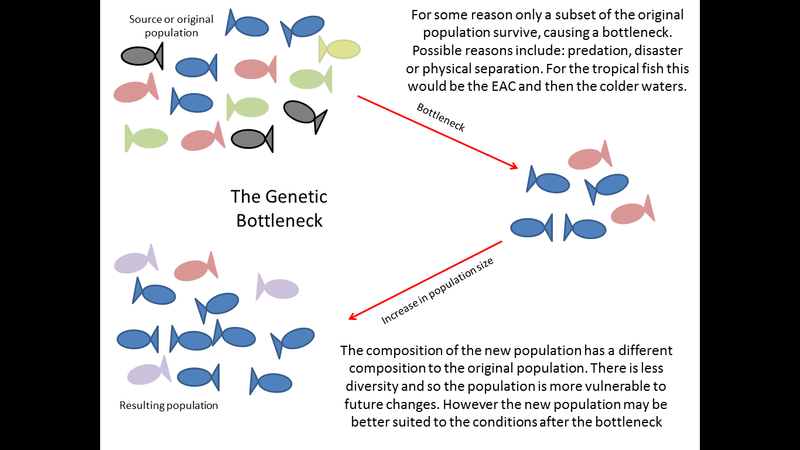 This is part of a genetic bottleneck that has been observed in the lab. Predators selectively kill the weaker members of the community. This is the second bottleneck through which the tropical fish have had to traverse, the first being the currents. Larval duration strongly correlates with the distance of dispersal⁴. That is, the longer the fish is in the larval stage the further they are carried by the current. Therefore, the faster fish can become mature and settle the less harsh the ecosystem will be for them. This may mean that the smaller tropical fish, which have shorter larval times, and can breed more rapidly may more easily colonise regions further south than their historical distribution. It is also likely that fish from higher latitude reefs will relocate with greater ease than the more equatorial species, which in turn may force the more polar species further from the reefs. Importantly, species that have low or no reliance on corals will be much more likely to avoid extinction⁵. These reasons mean that breeding of tropical fish in temperate regions is yet to be observed. One of the species Figueira studies (Abudefduf vaigiensis), which has become prevalent on the coast of NSW during the warmer months. Image source. What does all this mean for the future? Well, so far 47 tropical species have been cataloged along the NSW coast, over 1700km away from their usual habitat³. It is unknown whether climate change will increase the distance that the EAC moves vagrants. Warmer oceans may increase the force of the current, but will also decrease the duration of the larval stage. It has also been found that generally when two species interact one will have a competitive advantage in the warmer waters, and the other will have an advantage in cooler waters⁷. The probable influx of tropical fish, both predator and prey, will almost certainly change the dynamic of ecosystems along the coast⁸. 1. Figueira, W. F., Biro, P., Booth, D. J. & Valenzuela, V. C. 2009. Performance of tropical fish recruiting to temperate habitats: role of ambient temperature and implications of climate change. Marine Ecology Progress Series, 384, 231-239. 2. Figueira, W. F. & Booth, D. J. 2010. 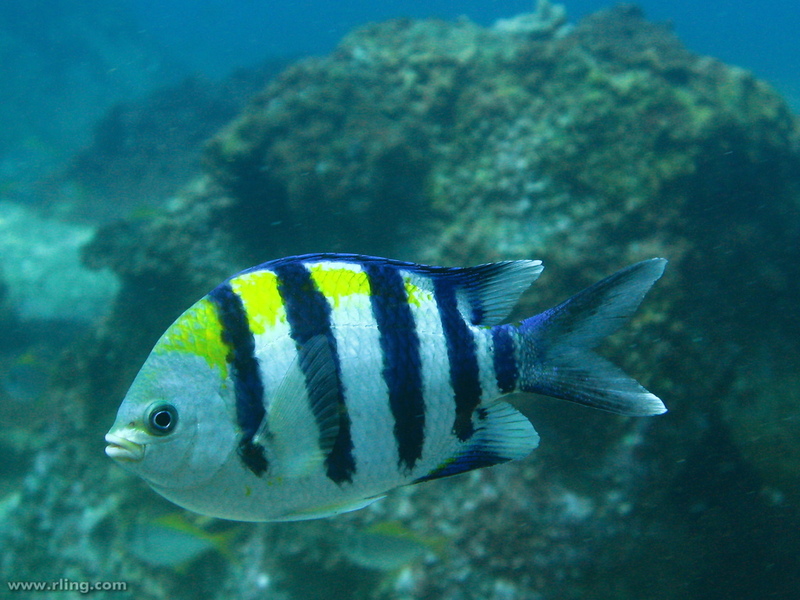 Increasing ocean temperatures allow tropical fishes to survive overwinter in temperate waters. Global Change Biology, 16, 506-516. 3. Figueira, W. F., Booth, D. J. & Gregson, M. A. 2008. Selective mortality of a coral reef damselfish: role of predator-competitor synergisms. Oecologia, 156, 215-226. 4. Booth, D. J., Figueira, W. F., Gregson, M. A., Brown, L. & Beretta, G. 2007. Occurrence of tropical fishes in temperate southeastern Australia: Role of the East Australian Current. Estuarine Coastal and Shelf Science, 72, 102-114. 5. Feary, D. A., Pratchett, M. S., Emslie, M. J., Fowler, A. M., Figueira, W. F., Luiz, O. J., Nakamura, Y. & Booth, D. J. 2014. Latitudinal shifts in coral reef fishes: why some species do and others do not shift. Fish and Fisheries, 15, 593-615. 6. Curley, B. G., Jordan, A. R., Figueira, W. F. & Valenzuela, V. C. 2013. A review of the biology and ecology of key fishes targeted by coastal fisheries in south-east Australia: identifying critical knowledge gaps required to improve spatial management. Reviews in Fish Biology and Fisheries, 23, 435-458. 7. Galaiduk, R., Figueira, W. F., Kingsford, M. J. & Curley, B. G. 2013. Factors driving the biogeographic distribution of two temperate Australian damselfishes and ramifications for range shifts. Marine Ecology Progress Series, 484, 189-202. 8. Poloczanska, E. S., Brown, C. J., Sydeman, W. J., Kiessling, W., Schoeman, D. S., Moore, P. J., Brander, K., Bruno, J. F., Buckley, L. B., Burrows, M. T., Duarte, C. M., Halpern, B. S., Holding, J., Kappel, C. V., O/’Connor, M. I., Pandolfi, J. M., Parmesan, C., Schwing, F., Thompson, S. A. & Richardson, A. J. 2013. Global imprint of climate change on marine life. Nature Clim. Change, 3, 919-925. Featured image sourced from here.